You are here: Home » Beauty or beast? I do not usually encourage diseases, including viruses, in the garden but, if you grow lilies there is one (or more) that is likely to make itself known and in a way that has major historical interest. The five viruses that make up what is rather more casually known as TBV or tulip breaking virus, are also known as lily mosaic virus. Unfortunately many lily bulbs are infected with this virus and it appears as streaked leaves in the early stages, often as quickly as a few weeks after infection. Typically the leaves have yellow streaks and then the flowers area affected, becoming streaked in early infection and then the flowers are distorted and, in later years the buds fail to form properly and the plants become stunted. Eventually the lilies just fade away. 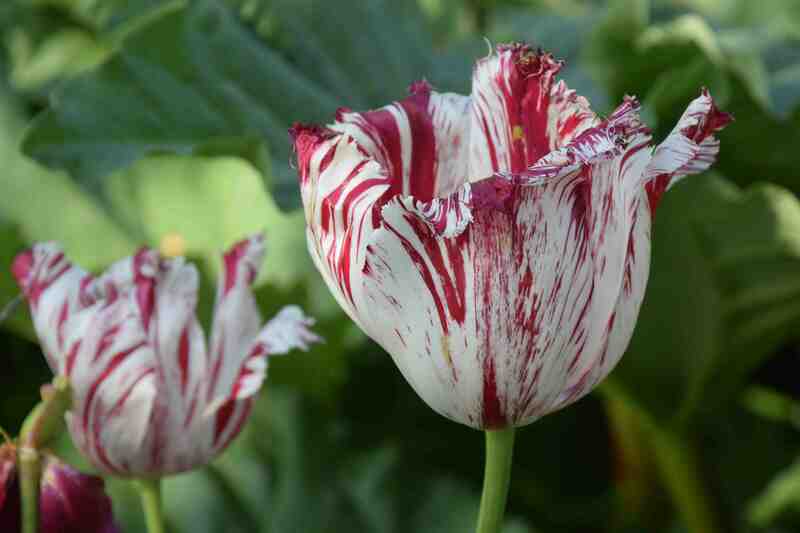 The same virus is passed to tulips where, in the early stages, the flowers become streaked as the virus causes the pigments in the cells may either be prevented from forming or they may be intensified. The result is flowers that are streaked or flamed with colour. The effect can be very attractive as is seen on the flower above which was an unnamed burgundy laced tulip (perhaps ‘Burgundy Lace’) but first showed signs of the virus last year. This year all the flowers from the bulb, which had been left undisturbed and had divided, showed similar patterning. 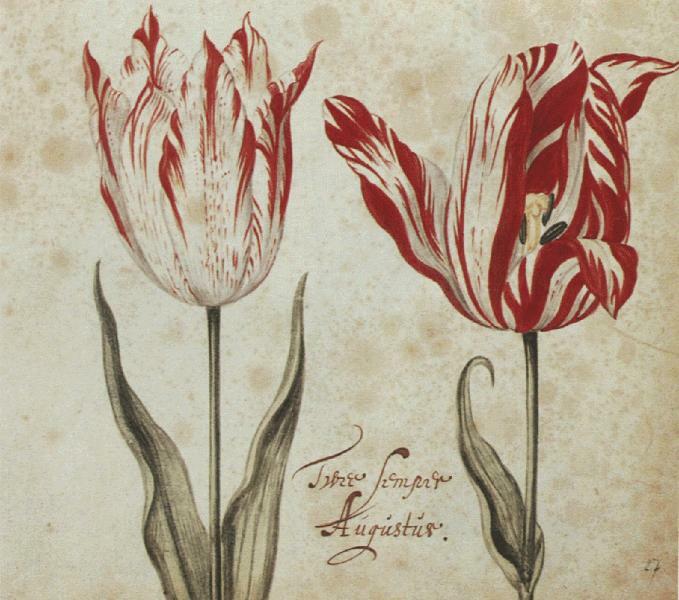 In fact, the pattern on the flowers is very similar to that of the infamous ‘Semper Augustus’ (below) which was one of the most famous tulips linked to the Dutch Tulipomania that caused people to make and lose fortunes in 1637. ‘Semper Augustus’ was so desirable that one bulb sold for 3,000 guilders which may not mean much until you see just what that much money would buy if you didn’t want just one tulip bulb! You could also buy eight fat pigs (240), four fat oxen (480), twelve fat sheep (120), 24 tons of wheat (448), 48 tons of rye (558), two hogsheads of wine (70), four barrels of beer (32), two tons of butter (192), 1,000 pounds of cheese (120), a silver drinking cup (60), clothes (80), a bed with mattress and bedding (100) and a ship (500). And I think I spend a lot on tulips! The trouble is that the virus that causes these patterns which made these tulips so desirable also slowly kill the bulbs. At the time it was not known what caused these patterns and it was thought that too much or too little feeding or leaving the bulbs out in the weather would cause the otherwise healthy bulbs to produce the desired patterns. Some Dutch growers did discover that if they grafted a portion of affected bulb onto a healthy bulb they could transfer the patterning but it was not until scientists in Norwich, UK, revealed the real cause of the patterns in 1937 that the virus responsible was isolated and named. I enjoyed reading how much you could get for 3000 guilders and how you thought you spend a lot on tulips. The markings are just like the pictures, you could have super rich back in the day! If only I had a time machine! Not to be outdone – I had a purple and white one very similar. Also an orange and yellow (not so obvious) . Both tulips side by side and planted very close to a lily. I wonder will the lily be ok. Looks like I may have to dig all of them out and I realise now that I have forgotten to mark them. Not pleased but glad of the info, thanks.